Stonewall Abbey Wellness is all about Lifting Body, Mind & Spirits! With Nationally Certified Personal Trainers & Instructors, you can be assured that you are receiving the highest quality instruction with personal attention and care to detail. We make all of our workouts effective, challenging & of course, FUN! We also offer one on one guidance in whole food nutrition, workout planning & goal setting for your personal success! 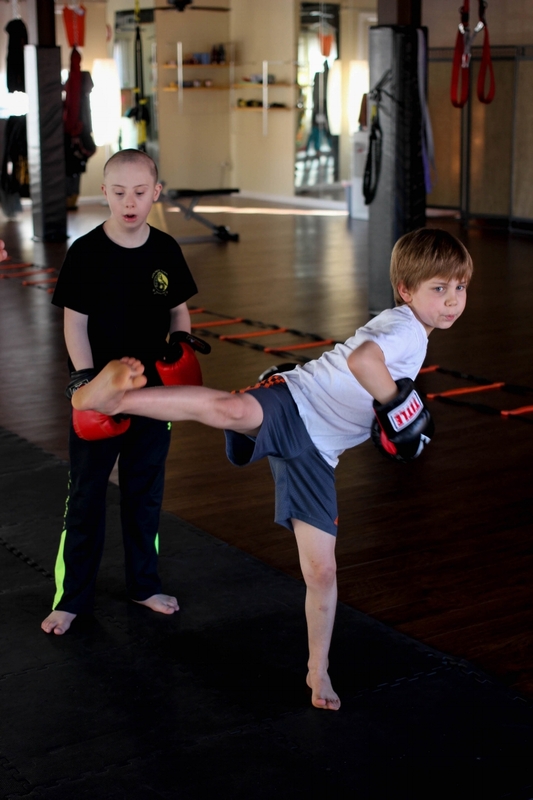 What we fondly like to refer to as the "Iron Dojo", our 2,000 square foot fitness facility offers sate of the art training equipment for strength, cardio & conditioning, right here in Rappahannock County! With showers, a far infrared sauna & keycard access, you can get your work out in, and get to work at your convenience. With quality, knowledgeable & tenured instructors, you can be sure that your specific health & fitness goals will be attended to, personally. All of our trainers are Nationally Certified through recognized and respected academies and universities, from our seasoned veterans to our brightest and best young trainers. We train together, study together, and test each other, with the newest research, time tested techniques, ancient methods and modern equipment to provide the best and safest workouts available. Whatever your personal goals are, or if you may need help developing those goals, our well schooled, mentored, and experienced Personal Trainers will help you achieve them all. With weekly training, monthly programming and annual goal setting, get on track, and stay on track with your own elite trainer. We provide safe, one on one training in a private setting, or small group training with your loved ones & friends, whole foods nutrition planning, goal setting and evaluation, and most importantly, accountability. We offer private coaching in strength & conditioning, athletic training, post rehabilitation & special needs, yoga, qigong & meditation. Click the button below to contact us for scheduling. Cross Training: varied training for an intense workout & total fitness. Kettle Bells, dumbbells, bodyweight, battle ropes, you name it, if we have it, chances are you will be learning to use it in this class. Toss a little competitiveness in with the fun and witness your results. MatFit: This mat based class offers full body conditioning using bodyweight exercises in timed intervals. Tone, strengthen and lengthen your muscles with these dynamic yet simple exercise programs. Fun, intense & effective! TRX: The original Bodyweight Suspension Training System. This revolutionary way to exercise brings an exciting edge to your personal fitness. You will get balance training, stabilization, all core all the time, and full body strength & conditioning. Want to learn how to use our equipment? Do you feel more motivated surrounded by your peers, working toward common goals? Does working out alone just not interest you? Group Fitness training is a perfect solution to get fit, gain knowledge in exercise & staying motivated and accountable to your fitness goals. We provide classes specifically designed for every general demographic, from those looking to be pushed to their limits, general fitness and mobility, to the specific needs of bodies that have high mileage and need safe, productive and fun routines to stay ambulant and allow you to do all things you want to do over the next ten, fifteen or twenty years (or more!). Our well trained staff are eager assist you in getting into the right program, for you! Composed of gentle body positioning stretches, massage & pressure point release benefiting those who find themselves stiff, sore, and tired from over-exertion in work or sports, or from arthritis or other debilitating diseases. Thai Yoga massage enhances strength and flexibility, relaxes sore or tense muscles, and can help to recapture lost range of motion. By encouraging lymphatic function, this traditional massage can also detoxify the body, heighten the immune system, and prevent disease and/or injury by promoting flexibility. Click the button below to contact us for scheduling. We offer classes 7 days a week from experienced, passionate instructors who provide you with safe, practical & enjoyable guidance through your personal practice. This athletic class provides a strong workout while developing balance and flexibility in a fun, intense and challenging new ways! You will progress quickly in your Asana (physical postures) practice by developing the strength and coordination required for more challenging poses. This style of yoga builds heat, flexibility and strength, while maintaining focus on good alignment and sound structure. Postures may be held for longer periods of time, and will flow together to unite the body to the breath and mind. Suitable for all levels. This class is open to all levels of practice and abilities and is especially suited for beginners or those searching for the therapeutic benefits of yoga. This soothing gentle practice focuses on moving slowly into basic yoga poses while using the breath as a tool to remain present and mindful. The slow pace of this of this class allows you to enjoy each pose. Expect lots of stretching and lengthening with a heavy dose of relaxation to wrap up your practice and leave you feeling great. Dao Yin is an ancient practice of soft (yin) stretches and breath techniques that offers a gentle, restorative and practical approach to flexibility and vitality in a warmed class room and is suitable for all ages & abilities. Qigong (or Chi- Kung) is a Chinese term that translates as “breathe (or energy) work” and refers to the wide spread practice of breathing and stretching techniques that began China’s 5,000 year old medical history. Qigong, sometimes called the grandmother of tai chi, is one of the four major branches of Traditional Chinese Medicine. 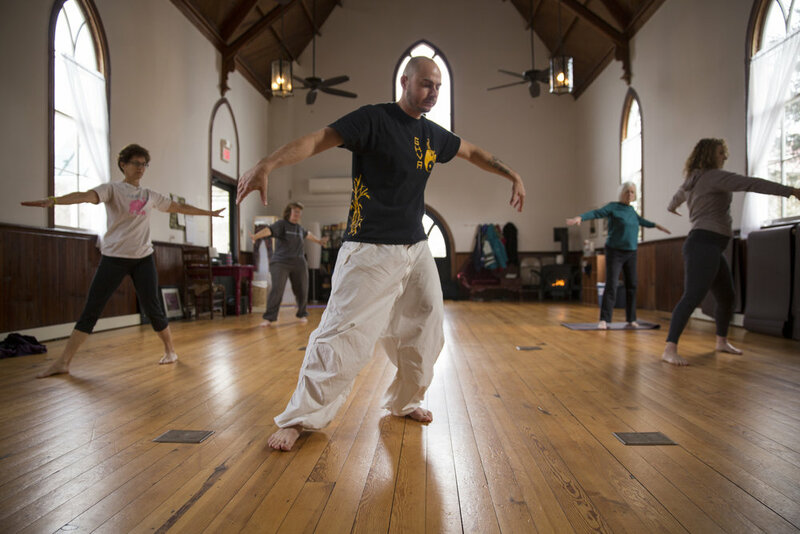 Because Qigong incorporates a variety of gentle breathing methods, flowing movements, and mindfulness meditation, it can be practiced by absolutely anyone, regardless of their age, health & fitness level. This complete martial arts curriculum has been designed to bring the best of traditional & modern training methods together for all of the ranges of hand to hand combat. With coaching from tenured experts in martial arts and conditioning instruction, you can be sure to get the best work out of your life along with learning essential & practical self defense skills. Great for men & women, for serous enthusiasts as well as those who are just looking for an awesome way to get into shape & have fun. Martial Arts for Every Body! Find out more about our instructors HERE! 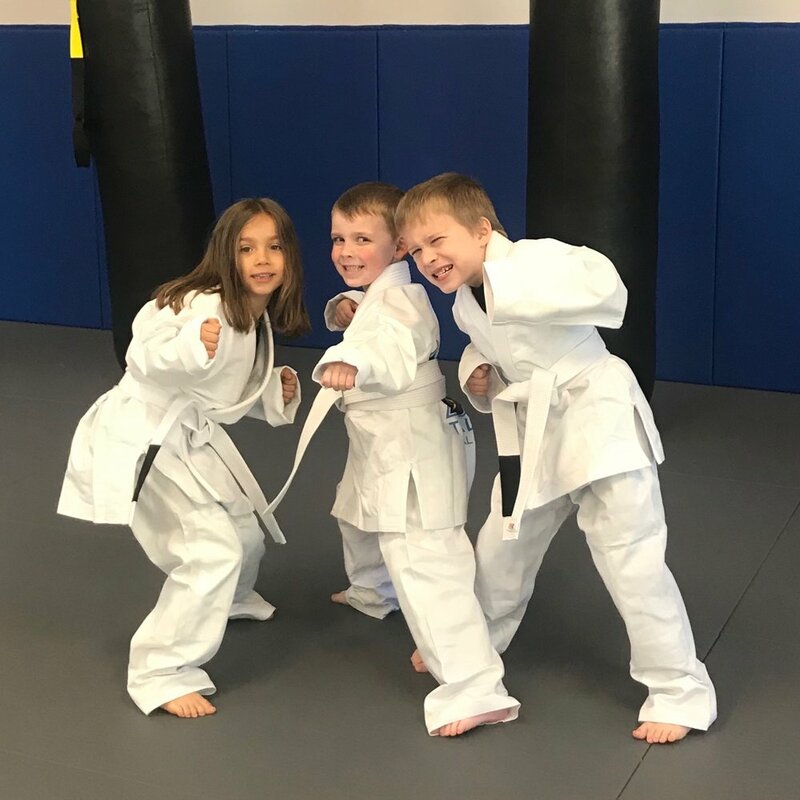 For Youth Martial Arts & Yoga Programs Click HERE! These contact based classes offer a great workout while focusing on standing attacks & defense utilizing the Science of the 8 Limbs Muay Thai & San Shou (free fighting techniques) from the Mantis Boxing System, using kicks, knees, elbows, strikes, counters, clinching, throws & takedowns. Brazilian Jiu-Jitsu (submission wrestling) provides practical & effective grappling designed for any woman or man to take the advantage, use leverage and overcome brute strength. With intense conditioning & live drilling, practitioners will safely learn proven life saving techniques in real time with resistance. This has proven time & again to be one of the most effective martial arts in the world, and a necessary addition to any standing or striking art. The Chinese grappling art Chin-Na translates as ‘to seize & control’ is a standing grappling & takedown system with 108 techniques & an infinite variety of variation according to the opponents resistance, response & position. Mantis refers to the praying mantis insect and its predatory hooking & trapping abilities. This compliments BJJ as well as San Shou Kickboxing perfectly. This Escrima, or Filipino martial art, and Shaolin Kung Fu based class offers a straight forward, practical and effective method for training with blunt & edged weapons. This class studies the use of the Long staff (cudgel), double and single short sticks, knives, swords & machetes, both offensively and defensively,armed & empty handed, counters, control and disarms. "Love yourself, sow Peace with others and you will reap Harmony with the world around you"
At the core of Totality Martial Arts is the 1,500 year old martial art of Northern Shaolin Praying Mantis Kung Fu. Kung Fu translates as ‘hard work to achieve great skill’. Shaolin Praying Mantis refers to the Chinese boxing style developed by the monks at Shaolin Monastery, the birthplace of Chan/Zen Buddhism. This system offers deep insight into human body mechanics and the physics of movement. What is unique is that the conditioning & training methods promote good health beyond being fight fit. Dynamic flexibility, coordination, strength & the Chan mindset all developed in this class. Training in this class is more focused on Taolu (Kata or Forms): fluid sequences of technique that program body alignment & proper mechanics. Open handed forms as well as traditional weapons such as the Long Staff, 3- Sectional Staff, Spear & Broadsword are practiced. This practice is perfect for those wanting to explore primal and structural body movement conditioning.